I’ve been keeping a running list of these for a while as my niece is turning 21 in a couple of weeks and graduating to start her life as a professional woman. These are all personal to me and my experiences, but what would you add? I’d love to put together a list for her with some collective wisdom from those of us who have been there and beyond. “We all make mistakes” is something people only say earnestly after they’ve made a mistake. If someone says it after you’ve made a mistake, they’re generally just being passive aggressive. That weird-sick-jealous feeling you get about your significant other will not exist in the right relationship. Save money out of every paycheck for travel money. You never want to miss someone’s big day because you spent too much at Target and the bars and you’re too broke to buy a plane ticket. The fastest way to fix something you did wrong is to admit it openly and immediately. Not being able to admit to being at fault is the first sign of crazy. You should avoid these people like the plague as there is no way to reason with them. Not everyone wants your opinion. In fact (spoiler alert!) your opinion isn’t even valuable half the time and it’s certainly not required. You are entitled to HAVE your opinion, not to SHARE your opinion. This is a key differentiation. You should never be a doormat, but forgiveness is a sign of strength. If you can forgive someone it probably means you are in a good place in your own life. Be thankful for that and don’t try to hold onto hurt just because you can justify it. Don’t give relationship advice. Ever. Just listen with a sympathetic look on your face and say nothing. Don’t even agree. Half the time they will end up getting back together and it’s very awkward for everyone. Everyone wants to be liked and we all keep score. Don’t ignore everyone else’s celebrations and act shocked when they don’t show up to yours. Insecurity is a bad look. In relationships, at work, etc. Fake it till you make it! 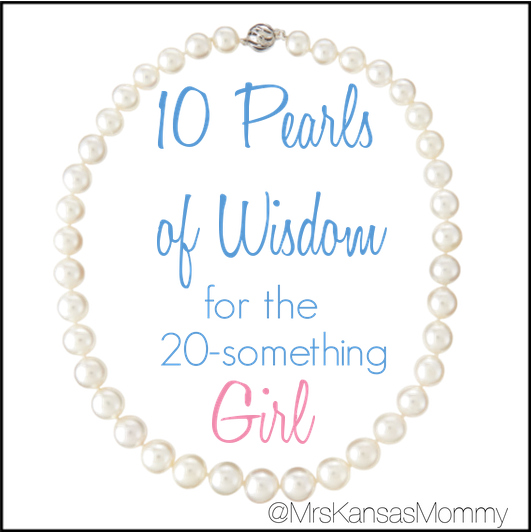 What advice would you give to a 20-something girl? #4 and #5..YES!!!!! My pearls of wisdom are just because someone does something differently than you would doesn’t make it wrong, it’s just different.